A decade of Bartolo Mascarello Barolo: my take on the wines…. Over the last two years I have been lucky to have a fellow group of Italian wine lovers that wanted to drink the great wines of Italy and we have structured each dinner along a certain theme or producer. It is now at the stage where demand for a spot for these dinners is so great, that the limited spots available fill up in a matter of hours. 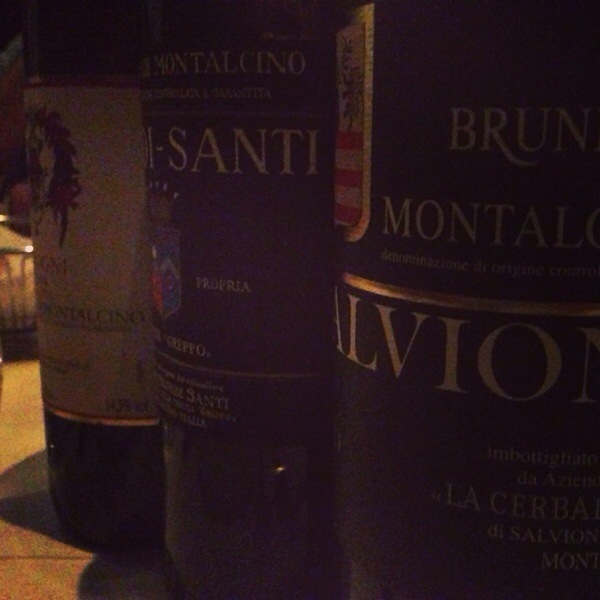 The wines either come from my cellar in Italy or cellars of individuals who attend the dinners. 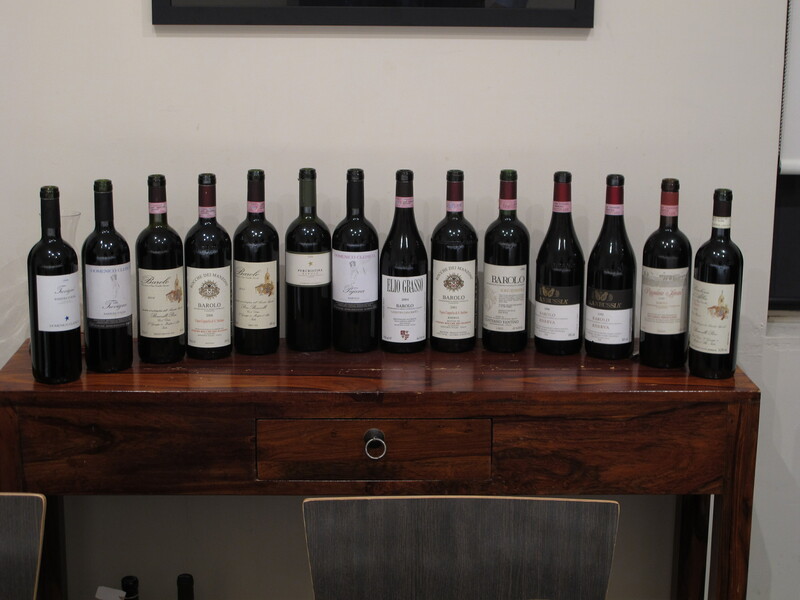 Last week we looked at a decade of Bartolo Mascarello Barolo, next month it is a decade of Giacomo Conterno Monfortino and in September, twenty vintages of Produttori del Barbaresco Barbaresco. Talk about educational. There is nothing like sharing great bottles with friends over dinner and last week we shared many great bottles. Apart from the 1999 and 2011 which weren’t great bottles (but I would still happily drink them if on my own) the line up overall was of a very high standard. These are the best of the best. Rare collectors items and it is good to see them drunk rather than hung on to. Below are some brief notes by myself on the wines. 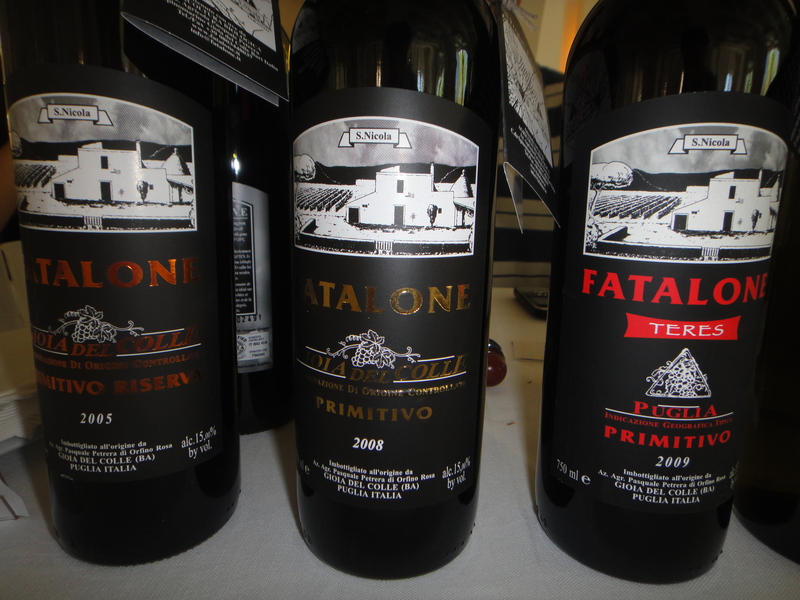 I have also listed Antonio Galloni as a comparison and sometimes with these wines, it is more about the bottle than the wine. Upfront and perfumed, lovely weight and structure. A wine to drink young and enjoy the yummy upfront fruits. Structured and intense, just starting to enter it’s drinking window with upfront typical Nebbiolo fruits and still with enough acidity to see it continue to improve in the short term. Riper in colour and more developed than the 2010. A bigger wine but not better than the 2010. I would drink this whilst waiting for the 2010 Langhe Nebbiolo to come round. Not a great bottle of 99 and already showing signs of oxidation. Storage is not an issue (climate controlled since release) so obviously a cork issue when you compare to Antonio Galloni’s notes. A surprise packet and showing extremely well. In the first stages of it’s drinking window, it is complex and unforced with beautifully rounded fruit and the structure to hold this length for many years to come. Like the 1999 this bottle was not a great example of the 2001 Mascarello Barolo. Hints of brett on the palate has stripped back some of that fruit leaving a wine that does not show it’s full potential. Probably the surprise packed of the night. Beautiful wine. For a vintage like 2003, which was one of the hottest on record in Barolo, this is a sensual, delicately poised wine that still has plenty left in the tank. A wine that shows you not to generalise vintages when you have masters like Mascarello in control. Close to perfection and the reason why Mascarello is held in such high esteem. Long, layered, unforced, complex and etheral. 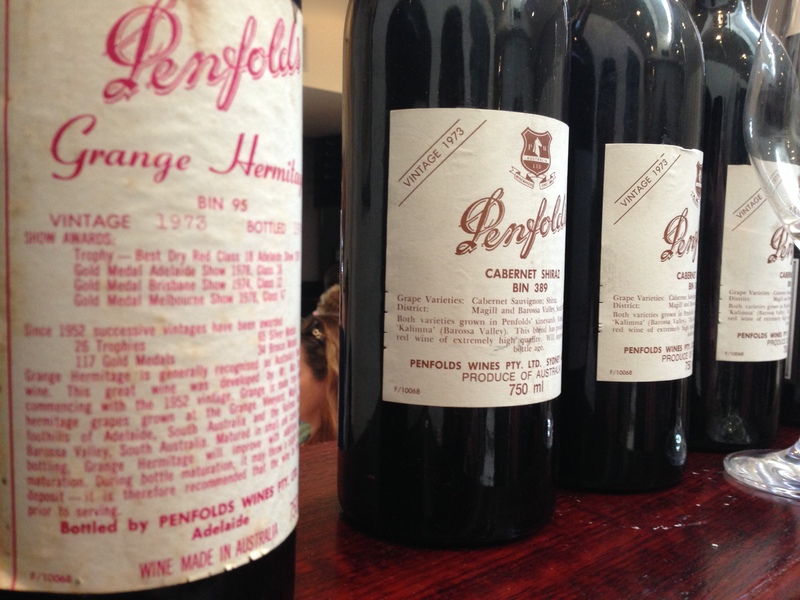 Still with decades in front of it, yet drinking so well from a young age. Another fantastic Mascarello, not in the same groove as 2004 but in terms of quality, this is a very fine Barolo. It is still a few years away from entering it’s drinking window, but once it does arrive, the future is bright for this wine. Wow. Up there with the 2004 in that it is close to perfect for a young Barolo. This wine is going to have a very long future ahead of it and already the complexity and class of this wine is obvious. This wine also highlights the quality Maria-Theresa Mascarello possesses and even with a generational change, the quality at Mascarello has never been higher. This wine is a product of the year but like the 2003 Barolo, it has handled the extreme heat conditions far better than most other producers. This wine is already on the front foot, without the tannin structure of classic years. It is a wine for those that prefer to drink Mascarello sooner rather than later. Whilst not showing at this young wine as the 2004 and 2006, there is no denying that this will join these wines in Barolo greatness. So young but if you hold into your wine in the glass long enough, it slowly opens up to show the enormous potential that is possesses. A fantastic Mascarello but without hitting the high notes of the previous vintage. Slightly forward and a good example of vintage variation with a typical Mascarello house style. 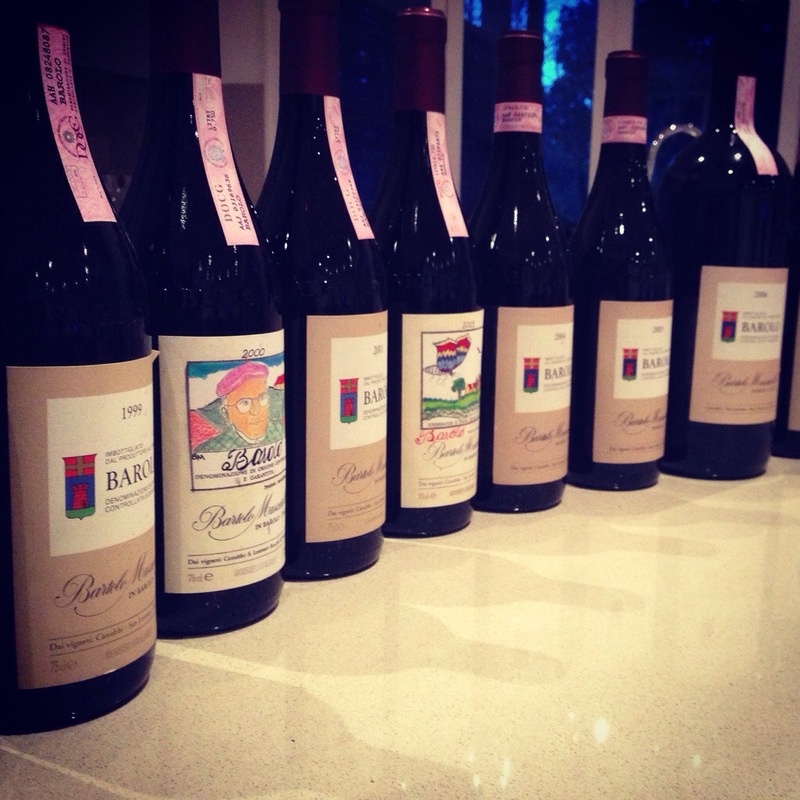 Getting excited: Ten Vintages of Bartolo Mascarello Barolo tomorrow night. 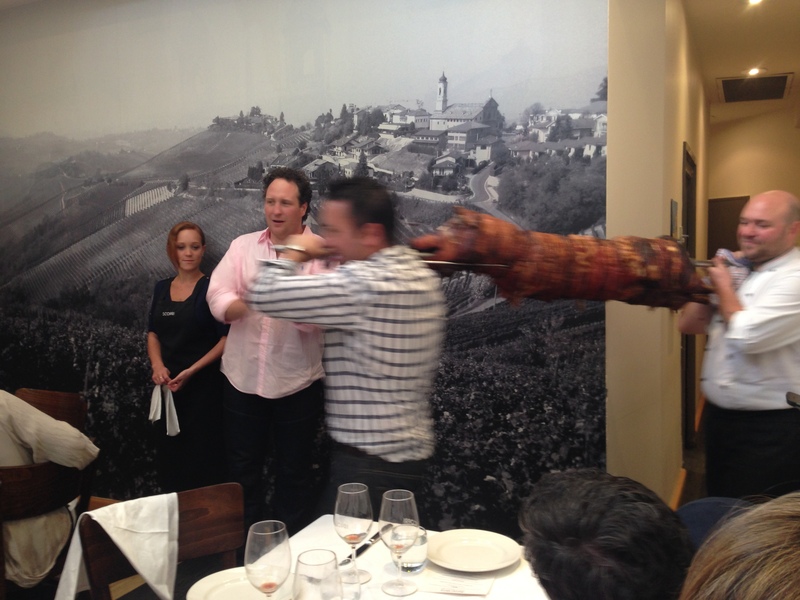 I have had some great dinners with a group of Italian wine lovers over the past two years. Tomorrow nights dinner looking at Bartolo Mascarello over a decade will be one of the best yet. After the dinner I will report back on the dozen or so wines we are going to drink on the night. 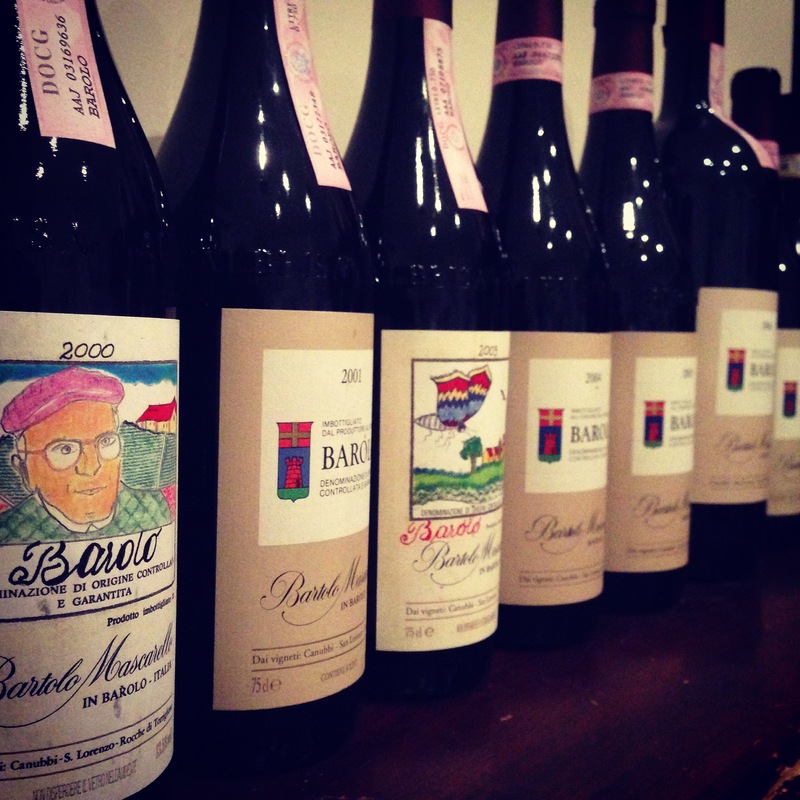 Over the last few months, a group of Italian wine lovers have been working our way through the cru’s of Barolo. Last month it was La Morra, last night in was Monforte and buy did the wines look good. 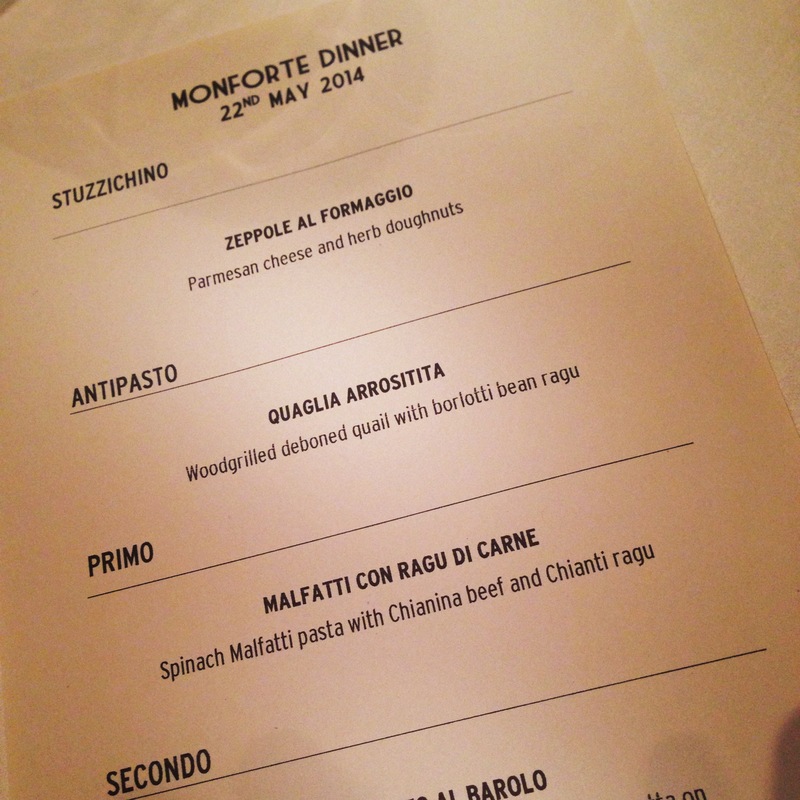 The menu for our Monforte dinner last night. The food as usual was a great match to the wines and whilst it has been a few months since my last visit to Scopri, and it reminded me just how good this restaurant is. The line up of wines from Monforte. In the next few days I will post full notes on the wines, but it was definately a great experience looking at sixteen wines from the different cru’s of Monforte from 1990 up to the current release 2010 vintage wines. Well for those that have been lucky enough to book a spot via the Scopri mailing list, we have Pasquale in Melbourne for one night on Monday 10th of February for a special dinner. This dinner sold out in record time and there are 30-40 listed on the mailing list. It should be a great night with a sneak peak of Pasquale’s new and unreleased 2006 Riserva (which will be released sometime this year) available to try on the night. The wines will be matched with typical Puglese dishes. 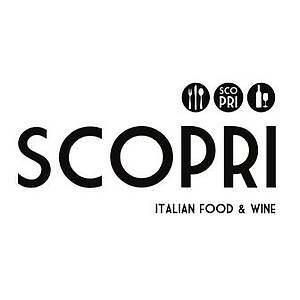 Last week, my regular wine group (we have been meeting roughly once a month for over ten years) got together at one of our favorite venues, Scopri for a dinner focused on Tuscan Sangiovese. 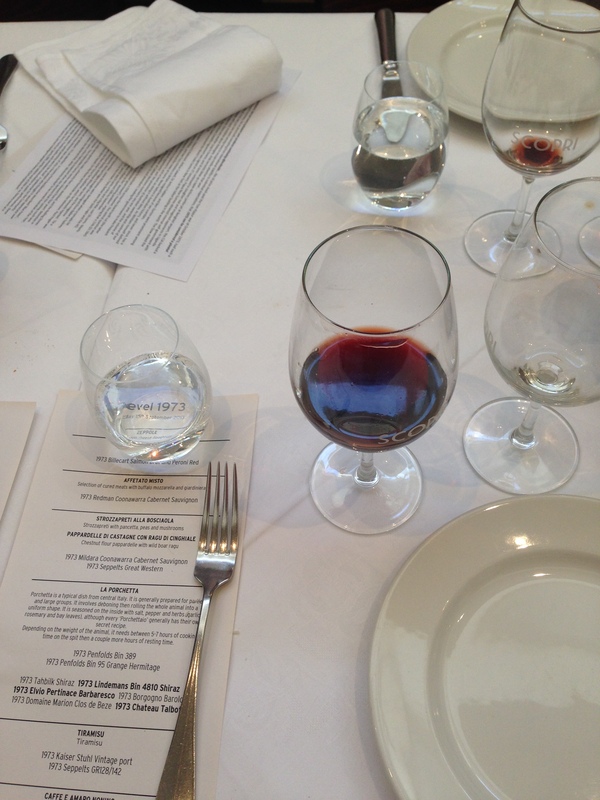 We looked at all styles (Brunello, Chianti Classico Riserva, Vino Nobile and Supertuscan). Whilst most of the wines I had drunk before, it again highlighted to me just how good this grape variety is and importantly how much times it needs to open up. A perfect example was the Biondi Santi Brunello do Montalcino 2006z this wine was opened 8 hours before dinner and even after it was poured, it was only in the last glass or so did it really start to shine. In the last hour, it opened up to show complexity, structure and tannin. I would have loved to keep a glass to drink the next day. So it shows that great wines need time. I love watching a wine evolve. However if your are drinking top line Italian varietals, they need any hours, if not a day to really open up if you decide to drink them before they enter their drinking windows. The late Franco Biondi Santi always opened the bottle the night before with one glass always taken out to let the wine breathe. After drinking his 2006, I could not agree more with this great man. Just a quick note to say that posting on my blog will return to normal in the next week or so. It has been a crazy period with a move into food (mainly cheese and prosciutto) now done. Boy did it take a lot out of me personally and it meant that most of my time has been taken up with the process of getting it all through to our climate controlled warehouses. In the meantime, did we celebrate in style yesterday with a 40th birthday of my good friend Mathew and his favorite restaurant Scopri. 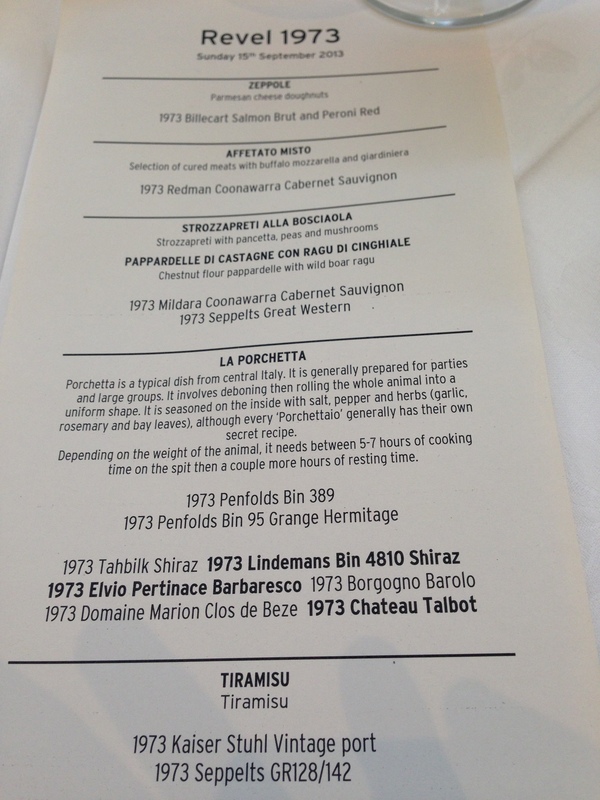 As you can see below, the wine was from Mathew’s birth year in 1973 and the music was Billboard’s Top 100 from 1973. The line up on the night. 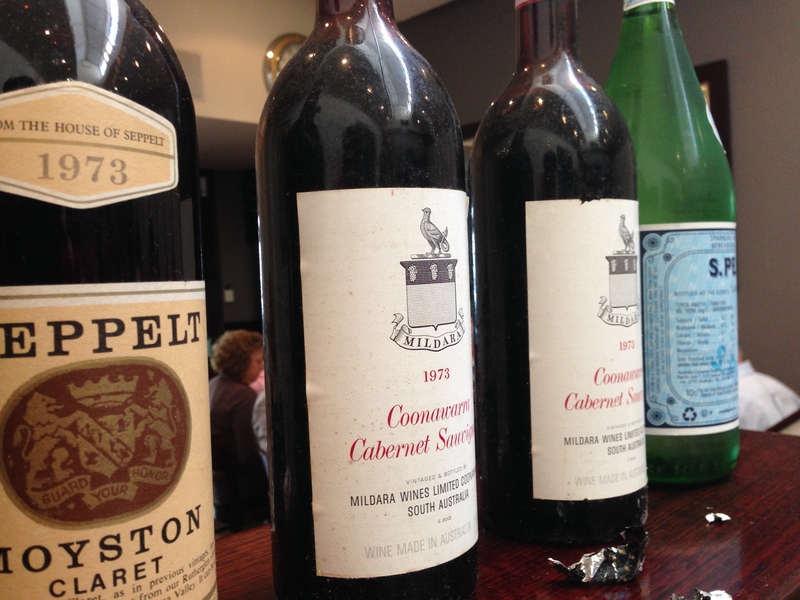 My good friend Mathew recently held a dinner @scorpi featuring five decades of Wendouree. 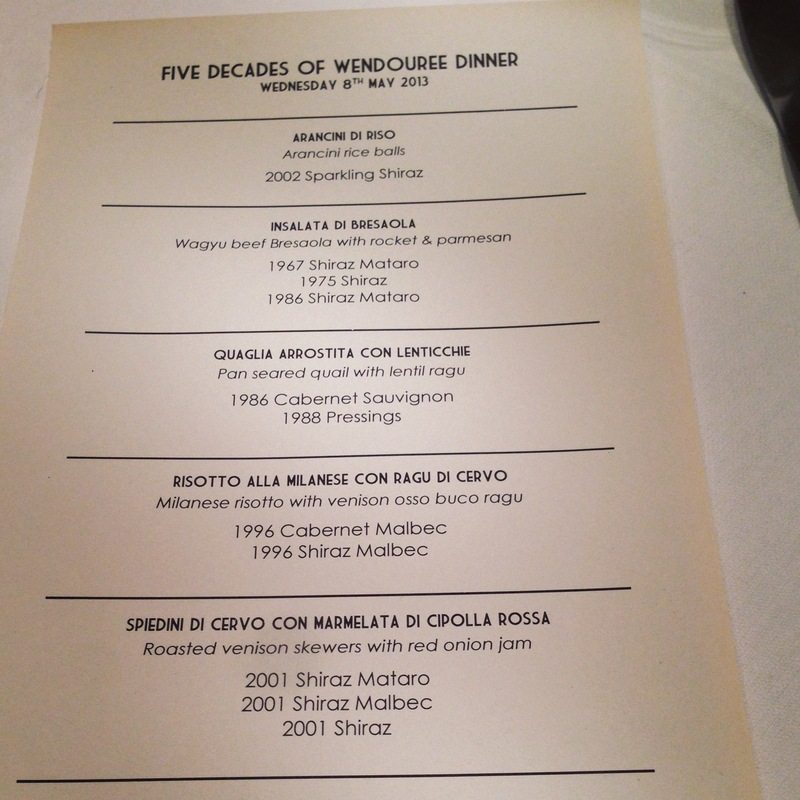 The wines looked so good and showed me just how long Wendouree can age for.